Max Patch is all about the timing. 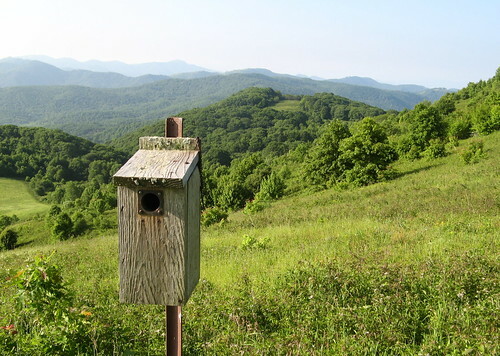 The grassy mountaintop near the North Carolina-Tennessee border is sublime on a clear morning from mid-May to mid-June, when rhododendrons and flame azaleas light up the nearby trails. The rest of the time, however, runs the gamut from blustery and rainy (merely uncomfortable) to snowy and stormy (potentially fatal). 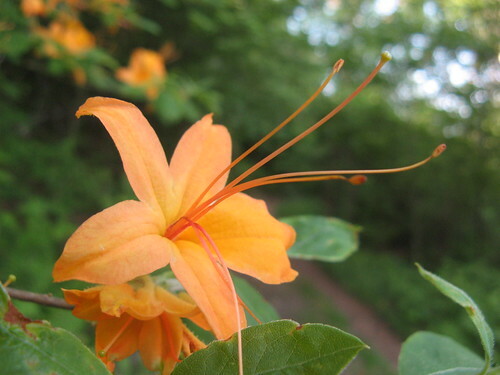 My timing was pretty much perfect, thanks to good weather, an early start and a tip from Lori Beth De Hertogh, blogger at Hiking the High Country, who left a comment on Friday raving about the flame azaleas near Max Patch. One of many flame azaleas I saw Saturday. Can’t imagine the bloom will last much longer; I saw many flowers, but very few buds. The rhododendrons are long gone, thanks to the hot spring and the middling elevation at Max Patch — 4,629 feet (fortunately, we’ve already covered the rhodo bloom this year). 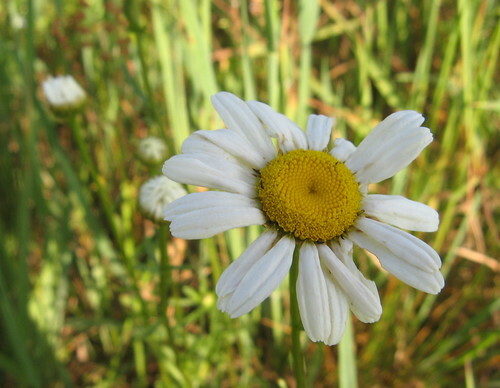 Assuming this is a wild daisy; can anybody set me straight? 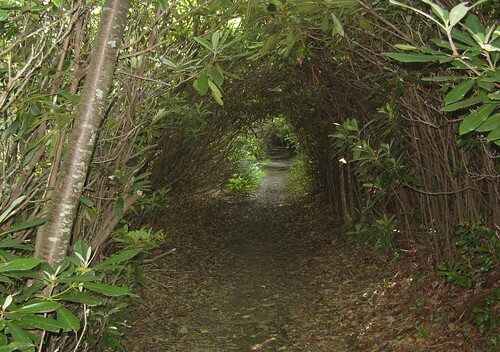 Rhododendron tunnels along the Appalachian Trail on the way down to Roaring Fork. 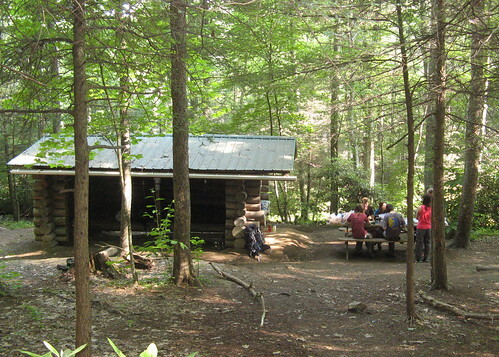 Here’s the Roaring Fork Shelter along the AT. The campers noted an abundance of mouse poop. 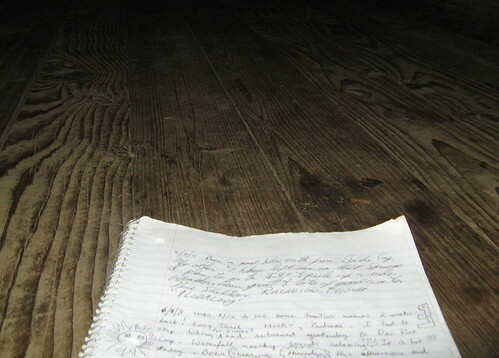 The Trail Log at Roaring Fork Shelter. 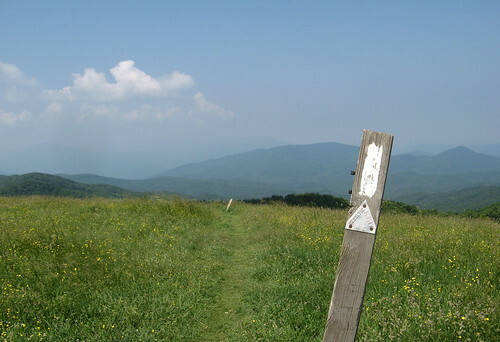 One entry recounted a harrowing Max Patch hike in a lightning storm the day before. Water under a footbridge in a creek feeding Roaring Fork. At this point I had two choices: walk another three miles to Lemon Gap and turn back, which raised the possibility of returning to Max Patch just in time for an afternoon thunderstorm. I decided to turn back, taking the AT to the Buckeye Ridge Trail to complete the loop around Max Patch, then ending with a quick jaunt to the top. 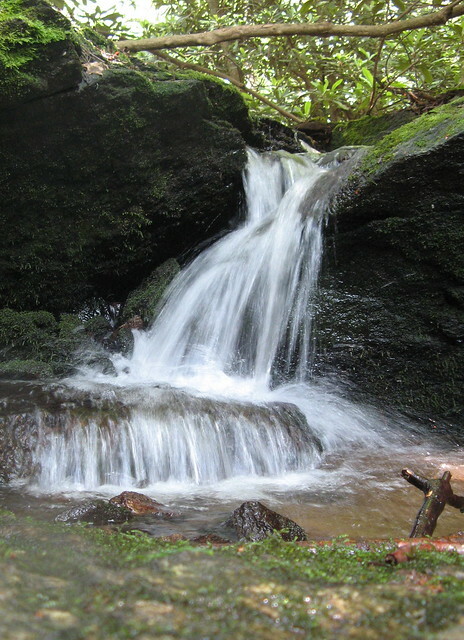 Small waterfall in another creek feeding Roaring Fork. 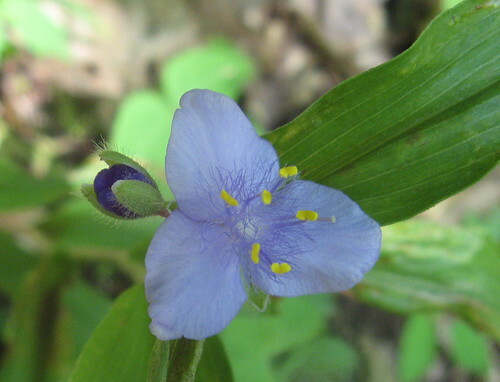 Mountain spiderwort along he Appalachian Trail. 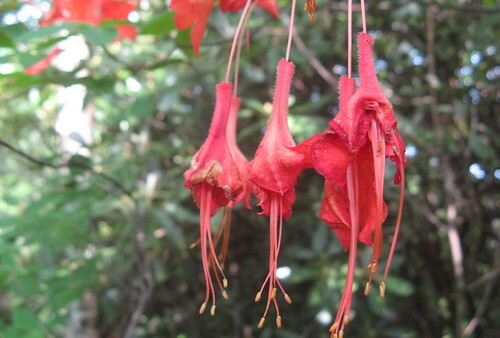 Heat was too much for these flame azaleas, apparently. 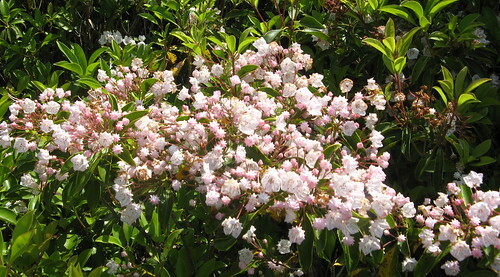 Whole bunch of mountain laurels blooming near Buckeye Ridge Trail. 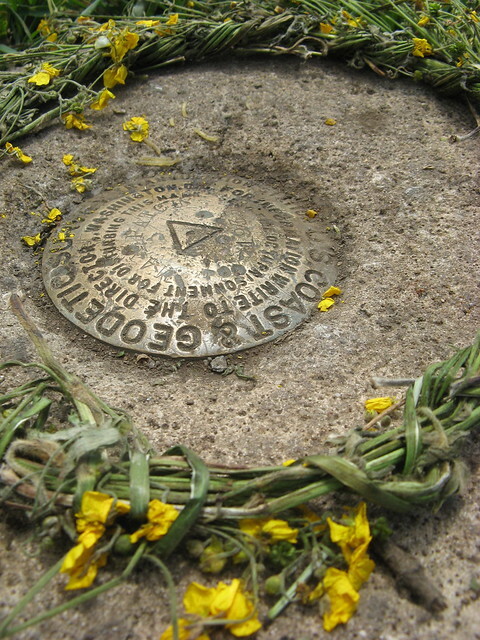 Here’s the Max Patch summit marker. Turns out he was a thru-hiker who’d been on the trail a couple weeks — he was off to a late start (Trail Days was nearly a month ago, and that’s about 200 miles north of Max Patch). He’d left that morning from Standing Bear Hostel, 13 miles south, and avoided the lousy-to-frightening weather that often greets late-risers at the Patch. All in all, a wonderful place to hike. The AT here is well groomed and decently graded — not nearly as steep as it gets in some places — and the wilderness experience is much more authentic compared to hikes near the Blue Ridge Parkway and the state parks (once you get into the woods, that is). Note if you’re driving up from Interstate 40: Exit 24 to N.C. Highway 209 to Max Patch Road is the most direct route — Google Maps’ directions suggest taking a byway called Wesley Creek Road that isn’t passable in a two-wheel drive car; a 4×4 truck or SUV might make it, but it’s way too ragged for your Subaru (or my all-wheel-drive Element). This post sure brings back memories. Max Patch bald summit was fogged and stormy when I hiked over it in ’03. Roaring Fork Shelter was crammed with about 15 of us and it snowed all night. An unforgettable experience the next morning as we sloggged through drifts. These are gorgeous photos–what kind of camera did you use? Ray: 15 in that shelter? Well, it must’ve been warm, as it was clearly built for maybe 7 or 8. This is my camera — nothin special, I just have some techniques worked out. Nice pictures once again. You gotta love those grassy highlands – they are rare in the Southern Appalachians, but the views they provide are unsurpassed. Love your posts-I also have an Element-‘o6 silver and blue. Awesome pictures of the AT. Did you use any photo software like Photoshop? Going to Yellowstone and Grand Tetons in September. 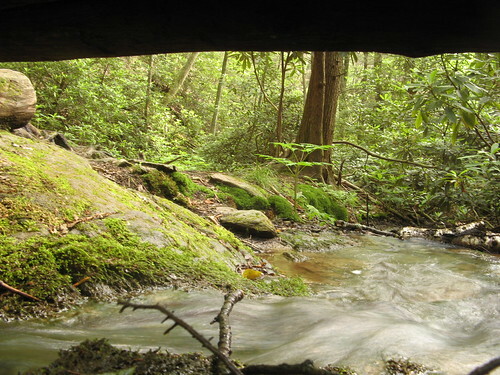 Looking for great day hikes. Appreciate any contacts. Ed: just cropped ’em in iPhoto if they needed it. I’m pretty sure Craig at http://theadventureblog.blogspot.com/ has been to Yellowstone recently … not sure about the Tetons. Love the post, Tom! I’m tickled pink that you headed down there; I hope it didn’t disappoint. Flowers’ll probably be gone, but I suspect it’ll still be a great hike. Really looks like a wonderful place to experience the beauty of Mother Nature in her many guises! Who needs California when you’ve got so many great escapes at your doorstep in veritable wilderness!